Udupi, Aug 25, 2015: As per reports, Urban Development Minister Vinay Kumar Sorake, on Aug 24 said that his ministry had submitted a proposal of Rs. 10 crore for improvement of infrastructure, and widening and development of roads in Udupi city for the Paryaya festival in January 2016. He was speaking at a review meeting of development projects at the District Offices Complex here. Minister Sorake said it was not right to press for more money as the State was facing drought. He outlined the measures that urban local bodies should take to become self-reliant. He directed the officials to follow the Belagavi model in this regard. All main streets of Udupi city should have footpaths. The roads should be widened where necessary through the Transfer of Development Rights scheme, he said. The Executive Engineer of the Public Works Department said the department had prepared an estimate for development of roads at Bannanje, Brahmagiri, Ajjarkad, Kinimulki, Diana, Kalsank, Badagupete, Rajangana, Tenkapete, Gundibail, Ambagilu and Mission Compound in Udupi city. 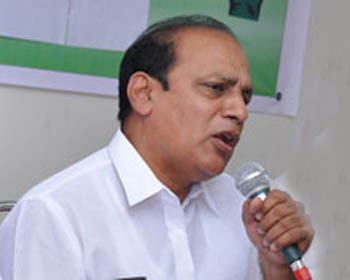 Local bodies should use the grants made available to them under the Nagarothana scheme and AMRUT schemes for development works, Minister Sorake said. He directed the officials to provide all facilities needed to the members of the Scheduled Castes and Scheduled Tribes. Officers should consider their issues from the point of view of welfare. The land reserved for backward classes in the district known as ‘DC Manna Bhoomi’ should be distributed to eligible SC/ST beneficiaries. Mass contact programmes should be held compulsorily in all taluks from next month, Mr. Sorake said. Udupi DC Dr. R Vishal said a committee has been formed under the CEO of Zilla Panchayat, M. Kangavalli, to provide housing to the homeless persons under the housing schemes.